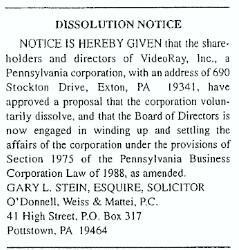 We do not have a standard form to advertise a Dissolution Notice. If you are uncertain of the form of advertising your notice must take, please consult an attorney. If you do not have an attorney, you may contact the Chester County Bar Association Lawyer Referral Service at 610.429.1500 or consult your telephone book. Below find an example of Notices as they have previously appeared in the Law Reporter.